After four years of planning, council bosses have finally approved designs for two new malt and grain Scotch whisky distilleries in the Scottish Borders. Mossburn Distillers, which this month began producing malt whisky at its new Torabhaig distillery on the Isle of Skye, intends to begin construction of two more distilleries, complete with warehousing and bottling facilities on a 50-acre greenfield site in Jedburgh in the coming months. The project is being overseen by former Scotland rugby union player Finlay Calder, who is working with Mossburn Distillers as projects director. 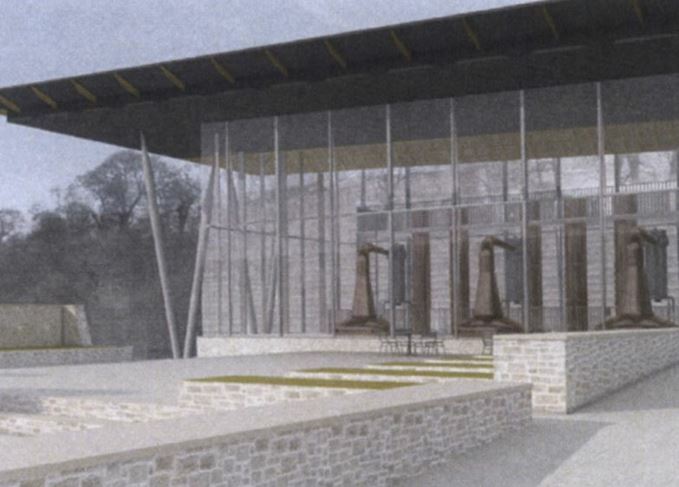 The two £40 million distilleries will be capable of producing four million litres of spirit a year, although the project, which will be completed in phases, is expected to take five years. Phase one will see the construction of a craft distillery and visitor centre named Jedhart – the name is subject to change – that will produce malt and grain whisky as well as neutral spirit. Jedhart distillery, which will be situated near the banks of the Jedwater river, will produce a range of spirit types, some of which will incorporate botanicals grown on-site in a walled garden. The garden will act as a separator between Jedhart and the second distillery, Mossburn, the name for which is also subject to change. Mossburn, which will be constructed in a second phase, will be a much larger malt and grain distillery also featuring both pot and copper stills. It will be situated adjacent to the A68 running from Darlington in England through to Edinburgh, and has been designed to showcase its four pot stills to motorists passing by. It will be split into two sections to accommodate visitors without disrupting production flow. Both distilleries have been designed ‘as a stage for the new stills’, and encourage visitors to ‘investigate’ the site through the gardens and local surroundings. Neil Mathieson, CEO of Mossburn Distillers, said whisky lovers would need to be very patient before they can visit the distilleries, or even taste their products. ‘We’ve taken four years to design the whole site, so building it isn’t going to be a quick job,’ he said. ‘It’ll be phased in so that the smaller distillery comes through first. Jedhart is the project name, but we have no idea what the distillery name will be. The site, home to the former Jedburgh Hotel which is now called Mossburn House, will also be home to landscaped gardens as well as a series of maturation warehouses, and a storage and bottling facility. The Cleathaugh steading adjacent to Mossburn House will be converted into offices accessible via a courtyard. The Jedburgh distilleries will be the latest developments to return Scotch whisky distilling to the Scottish Borders for the first time in 180 years. They follow behind the construction of Borders distillery in Hawick, which is set to open later this year. The owner of Torabhaig distillery has released two blended malts created using bespoke cask bills.